You can customize the playsheet in the Mini Play Paks with your logo, tagline, or other information… which makes it a great marketing tool! The customization goes on the connect-the-dot side, so your info is right in front of the kids as they complete the dot-to-dot design. To do this, there is a $35 one-time setup fee, and a minimum print run of 2,000 units (Unit price is still just $.20). We can also print your kids menu on an insert sheet that goes inside the Mini Play Pak…making it a self-contained tabletop toy and kids menu all in one! To do this, there is the $35 one-time setup fee, and a minimal increase of $.03 per unit… now $.23 each and the same print run of 2,000 units. 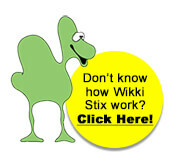 For further information on these options, simply click: info@wikkistix.com. You will need to provide your name, email address and phone number for us to respond, and please allow 48 hours to hear from us!